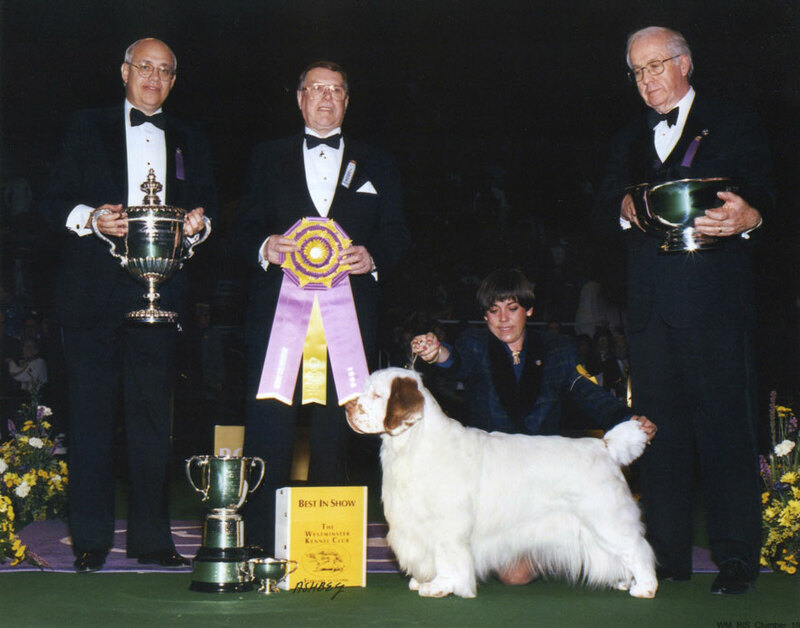 Brady was the first and only Clumber Spaniel to win Best In Show at the prestigious Westminster Kennel Club Show. In 1996 he also became the top winning Clumber Spanilel in the history of the breed, world wide. He was owned by Rich and Judy Zaleski and shown exclusively by Jane Alston-Meyer. Brady put the Clumber Spaniel in the public eye. Today hundreds of Clumber owners will say they were first introduced to the breed by Brady. With his charming temperament and beautiful type, he was a natural to be the ambasador of the breed. Brady was from the first Clussexx litter. That litter of 4 puppies is truley the foundation of our kennel.